Last month's update to our Brute Force program stopped automatically displaying the equations and parameters I used to solve each puzzle. It accidentally flagged the puzzle as changed when the button to display that information was clicked. As a result, when the puzzle was closed users were always asked if they wanted to save changes. Brute Force Version 3.4 corrects that problem. It also corrects a scaling problem which occurred in the "Change Title" dialogs for lower resolution screens. Finally, the program also now allows removing images associated with puzzles if no longer wanted. Formerly, they could be added or changed but not removed. 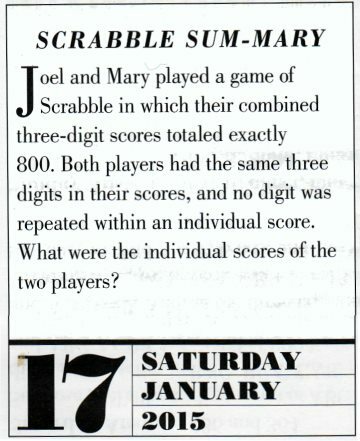 These problems were found when I was solving yesterday's Mensa Calendar puzzle displayed at right. It is included with the current downloads and, surprisingly, can be solved with only two equations! By the way, the 2015 Mensa Puzzle Calendar is now on sale at Amazon for 1/2 price ($6.99). If you enjoy puzzles, check it out. Here's a "Word Search" puzzle solver motivated by a Mensa Puzzle Calendar entry which asks viewers to find five 7-letter words in the given grid by following "crooked" paths. The search rules require moving from each letter to an adjacent letter horizontally, vertically, or diagonally to the next letter and no letter may be revisited within a single word. The puzzle is one of several included in the program downloads. Users may play by clicking cells to form words. They may also change size, contents, target words, search style, etc. and save/reload modified or new puzzles. February 2, 2015: Two small updates this week. If you already have these programs but haven't seen the problems fixed, it's probably not worth the time to download. Logic Problem Solver V5.5 fixes a problem a user was having saving a new logic case. Making the automatic backup copy of the existing file with that name failed under some conditions. The Unscramble V2.2, program, part of our Wordstuff collection, corrects range of maximum and minimum word lengths to find. It now keeps them within the valid range based on the length of the current scrambled word. February 10: The RSA Key algorithm is well known to those involved with securely exchanging data electronically. I implemented my demo version because I wanted to see how it worked and "just for fun". RSA Public Key Demo V2.1 was posted today fixing a subtle bug which occasionally generated RSA keys so secure that the encrypted data could never be decrypted! I had never encountered the error myself, but a sharp user did and even provided a program to replicate the error. February 15, 2015: Having survived Friday the 13th, I resurrected this Friday the 13th program to check for other occurrences this year and discovered that we have two more (in March and November). That's the maximum that can occur in a year and we won't see three in a year again until 2026, then 2037. It's an interesting mental exercise to understand why there are 11 year gaps going forward but only 6 years since the last occurrence when I first posted this program in in 2009. The program is also useful for finding occurrences of specific days and dates, e.g. when is the next time your birthday falls on your birth day? February 18, 2015: Several years ago I was attracted to the problem of locating objects from sensors which could measure distance to a target but had no idea about its direction. Your GPS is an example of such a target which does the calculation by reading satellite signals containing timestamps allowing the device to calculate how far it is from each satellite. It takes 4 such satellite signals to determine a location using mathematics similar to those contained in my program, Point from 4 Sensors. A viewer recently reported an error in a sample sensor equation in the web page description, although the implementation in the program was correct. In the process of verifying (and correcting) the web page error, I cleaned up a couple problems with program displays caused by my use of text scaling on my monitor. Since I had the program open anyway, I fixed those and posted the update today as Version 5.1.